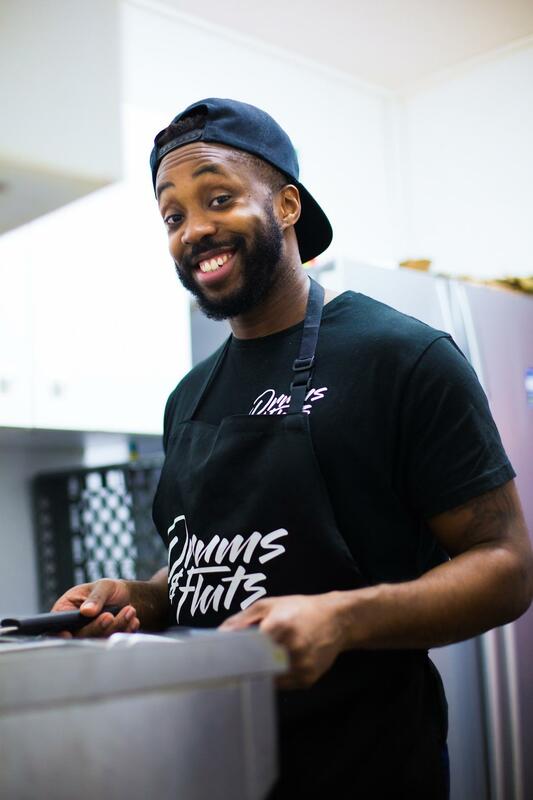 These South Londoners Want to Inspire Young Entrepreneurs with Fried Chicken! Fried chicken is a London institution. Piping hot, well seasoned, and with a satisfyingly thick layer of crisp batter, it’s the full stop at the end of a night out, the affordable after-school meal for jostling, uniformed teenagers, and the inspiration for 2017’s favourite YouTube star,The Chicken Connoisseur. There are reportedly 8,000 fast food outlets in the capital, and the fried chicken market is worth billions of pounds. 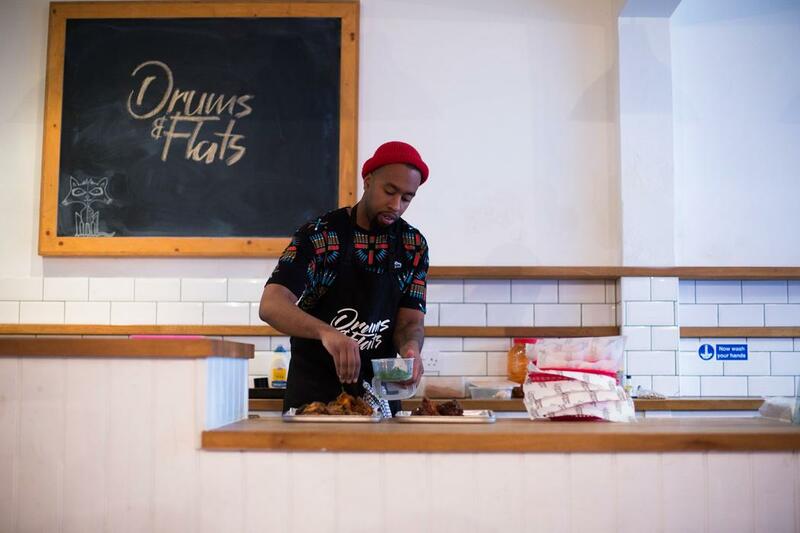 South London locals Khamisi McKenzie and Daniel Opoku-Baah have been making their mark on the fried chicken world for just over a year withDrums & Flats, a food pop-up and catering business. 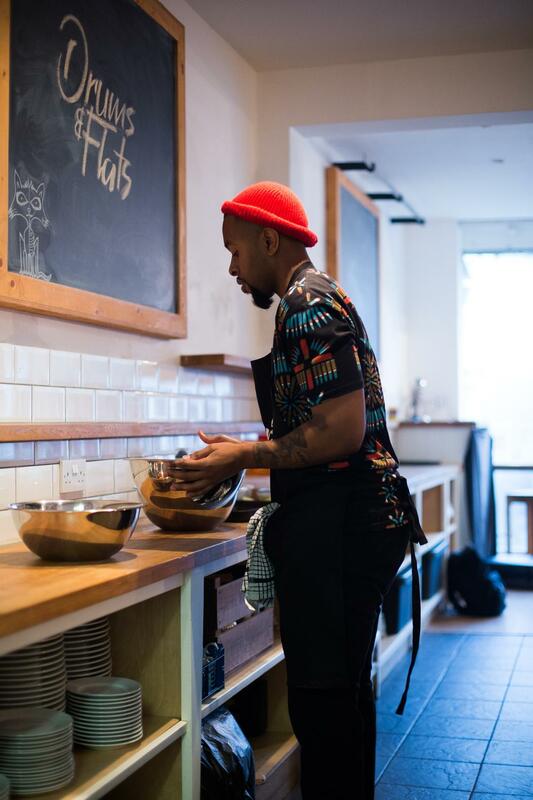 As second-generation immigrants from working-class backgrounds, they stand in opposition to the arguably culturally appropriative practices of Caribbean food outlets likeWhite Men Can’t Jerk, and are vocal about their roots. 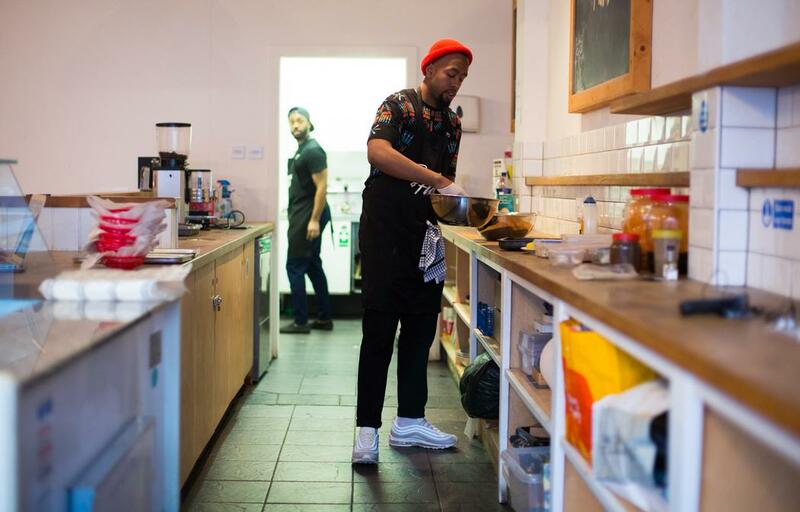 Khamisi McKenzie (foreground) and Daniel Opoku-Baah, founders of Drums & Flats, cooking at a cafe near their new Peckham Levels premises. All photos by Almass Badat. McKenzie and Opoku-Baah recently moved Drums & Flats into its first permanent residence at multi-storey-car-park-turned-food-and-arts-hub Peckham Levels, with the intent of “maintaining a presence in the area.” Earlier this year, it was reported that house prices in Peckham have grown faster than Mayfair over the last eight years, causing generations-old black businesses to be moved to backstreets as the council persists with its regeneration project. 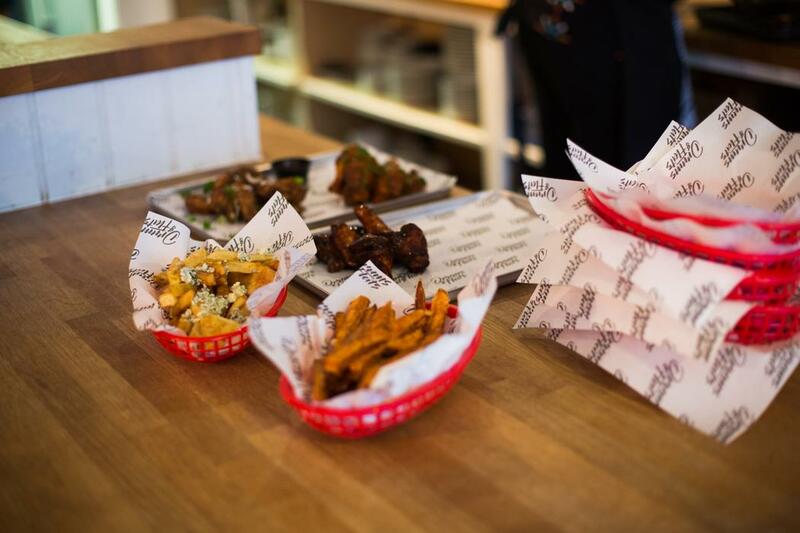 I meet McKenzie and Opoku-Baah in an unremarkable cafe close to their new Peckham Levels premises, where they serve me a perfect platter of four types of chicken wings, doused respectively in a glossy barbecue sauce, spicy red cayenne pepper, potently spiced jerk, and tangy lemon pepper. Sides include the best sweet potato fries I’ve ever eaten—perfectly cooked and covered in melty, gooey Stilton. Then there’s the jerk halloumi burger, solid vegetarian fare with a slab of tomato and slow-cooked caramelised onions thrown in for good measure. And, of course, a side of thick-cut plantain. 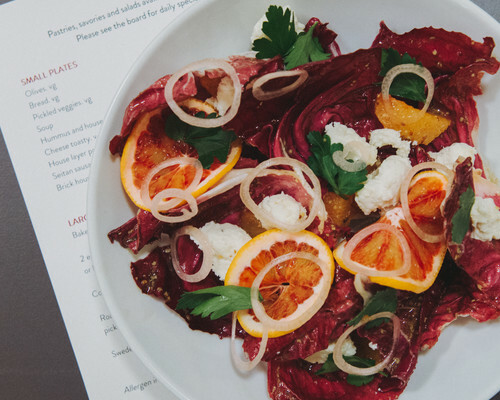 The pair don’t pretend to be master chefs (they’d much prefer to be out of the kitchen and managing the business), but they care a lot about their meat, which is sourced from nearby independent butchers Murray Bros. 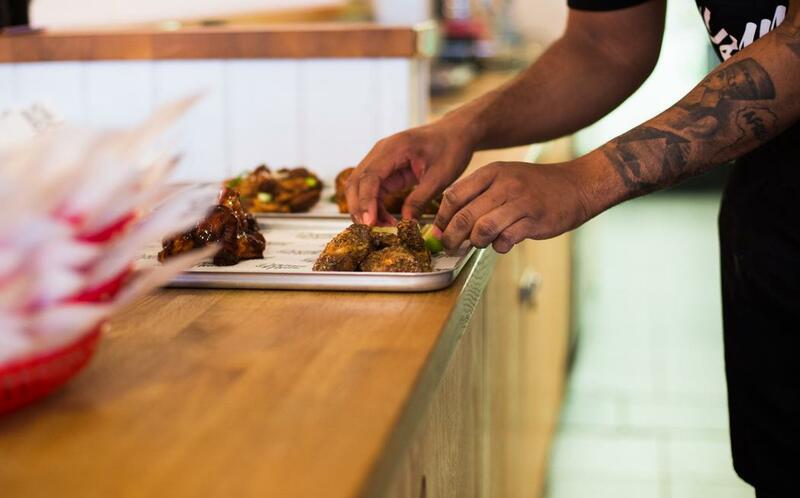 They also use a secret jerk rub, which is thoroughly massaged into the chicken each night before they begin a day of deep-fat frying, ensuring that the flavours hum in your mouth after every bite. 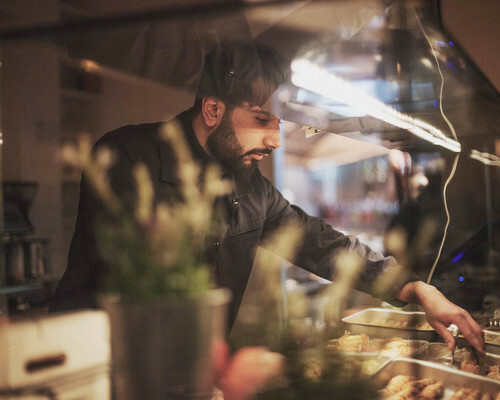 “My grandma told me when she tasted my food: ‘Make sure you don’t tell no one this recipe.’ So I have to listen to her,” says Khamisi when I ask him about the rich, nutmeg-led spices in the jerk rub. The last time he didn’t listen to her business advice, things didn’t end well. “It came back to bite me,” he remembers. The pair’s entrepreneurial spirit—and love of strongly flavoured food—is typical of their backgrounds. The immigrant hustle runs deep. Opoku-Baah’s heritage is Ghanaian and he laughs that “seasoning of food basically to us seems like a natural thing to do,” bringing to mind Niall Horan’s viral Snapchat of under-seasoned chicken—and basically any joke that references bland “white” food. Khamisi is Jamaican and learned about seasoning from his mum. McKenzie and Opoku-Baah have been friends for 17 years. Over our plate of wings, they recall fond memories of playing hours of football and going to the chicken shop after school, teasing each other in the easy manner of brothers as they argue over the correct pronunciation of “plantain” (McKenzie thinks it’s “plantin,” Opoku-Baah, “plantain”). “You’ll realise who’s correct when you start doing mountain climbing and drinking from the fountain,” McKenzie says, winning the debate. “Volatile, irrational, passionate,” says McKenzie. They both giggle.